Thank you Bonnie Chichester for creating this wonderful one page summary of the Creating Stories post!! *Check the end of the post for a great chart created by Bonnie Chichester based on this post!! Thank you Bonnie!!!! There is a great discussion taking place on the IFLT/NTPRS/CI Teaching page on Facebook! about how to choose structures that create interesting stories. I have a list somewhere that is a little more complete, but until I find it, here goes…. Is at Costco and the credit card has no limit. Is on a beach but doesn’t have sunscreen for his/her whole body. Is at the cashier after eating at a restaurant but doesn’t have money. Is at a funeral but doesn’t have any idea who the deceased is. Is at Starbucks, and Starbucks has no milk for coffee so puts_____in the coffee. Is on Dancing with the Stars but has no partner so asks many people to dance. Is at a birthday party but has no gift so looks for a gift in the house/restaurant. Looks like folks there are starting a bit of a data base for ideas…come join us! Here is the chart Bonnie put together!! Each of the three Level 2 had co-created a great story the Thursday before and I wanted to go back and review the story on Monday. My classes are good-sized: 30-34 students and I often feel like I am herding cats trying to keep us all together going the same direction at the same time. This was a total experiment, but I loved the result! I divided the class into four groups. Each group had 1/2 of a large white board (I have two large boards, on opposite sides of the room) They arranged their chairs (we are deskless) in a semi-circle around their particular white board section. 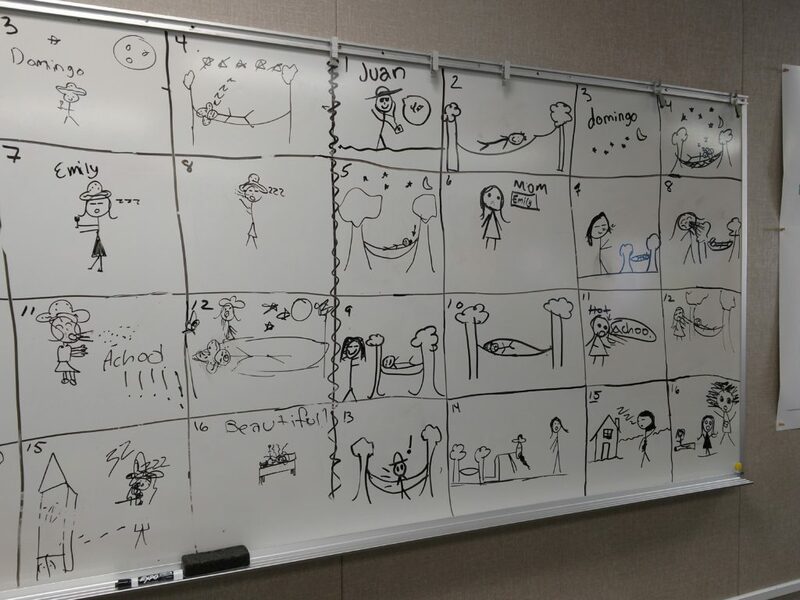 I had drawn a grid of 16 squares on each white board and numbered them. One student went to the board in each group. I read the first sentence from the story out loud, in Spanish, and the author had THIRTY seconds to sketch that sentence in box #1. ONLY 30 SECONDS! The group was allowed to help with meaning and ideas for the sketch. ( Rules: No criticism of artwork or interpretation allowed. Suggestions welcome. English allowed…these were middle schoolers at the beginning of level 2) )We all applauded the artists and the next student went to the board. My plan was to go until it fell apart. (Did you ever do that with a new activity?!!) But it never did! It just kept building momentum! BONDING BONDING and more BONDING! These classes are a mixture of 7th and 8th graders with a 6th grader or two mixed in. The school has nearly 1000 students. They just don’t know each other outside of my class and they really got a chance to work with new people and connect. The rules kept great artists from getting frustrated and instead made them the expert with helpful suggestions and ideas. The students that weren’t as comfortable with the language had the support of the stronger students in the group. The kids who had no confidence in their artwork had the support of their group’s ideas. GREATER COMPREHENSION! 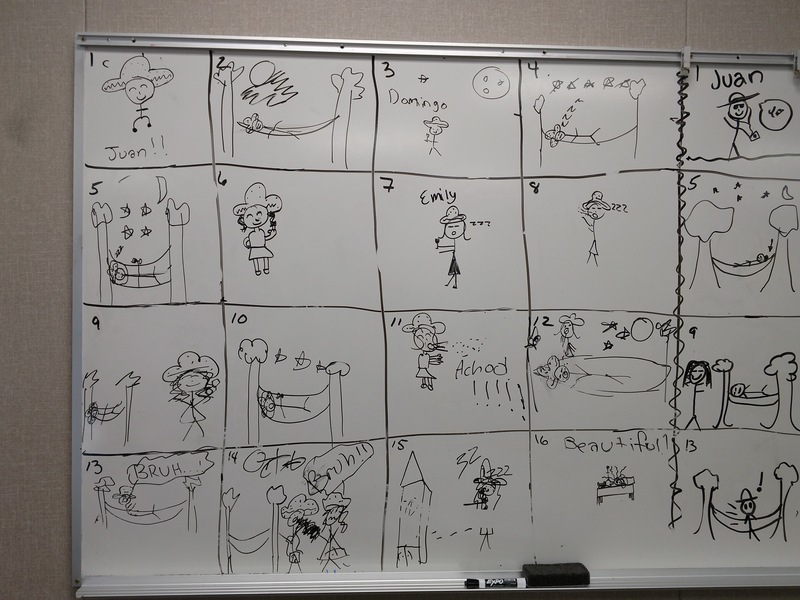 We revisited the story with the drawing and then, we used the drawings for several follow up activities! Each time my slower processing students understood the story with more detail and my faster processors were not bored in the least. Their own artwork was intriguing! LAUGHTER! The fact that they only had 30 seconds to draw created just enough tension to lessen the pressure for perfection. In each group (without prompting from me1) one artist added a funny detail to the picture. It might have been a funny haircut on a stick figure or a facial expression etc. Then every artist afterwards continued to use it. It started a series of laughter among students who really hadn’t known each other well. I’ll follow up in the next post with our follow up activities! If you are just starting out with TPRS, and you feel as if you are not doing enough with your students fast enough….take heart….you have an enormous advantage!!! WE HAVE TO START SLOWLY. I put TPRS+slow into Google just for fun and discovered HUNDREDS of pieces that address how important it is to start off slowly with students who are new to language and/or new to being in a TPRS classroom. I am choosing only one skill/concept as a goal for my students per week. The only goal I am really focusing on this week is Listening Well. I have to be honest….it’s killing me to do it. I can think of DOZENS of things that I could add to class right now that would make it more interesting, but I know that if I want them to listen WELL, I’d better stick with that. Now, I am sneaking in opportunities for next week’s goal which is RESPOND WELL. We all know that no skill really works in isolation. But I don’t expect to see any progress in anything other than the LISTENING WELL. Be patient when they get too excited about what we are doing to only listen. Remind them that listening and talking should not be done simultaneously. Wait, and wait, and wait, until they are listening. Ask any student who responds to or asks a question to wait until their peers are quiet before they speak. It is so hard to move in baby steps when there is so much ground to cover. But this kind of teaching is about the journey not the destination. I have to be where my students are, NOT try to get them to where I want to be. It’s the only way we will ever be together. I realized today that part of my ‘inner stress” comes from thinking that I am not in control if I meet them where they are. My perspective was skewed. I cannot change where they are right this minute. I AM NOT SUPPOSED TO BE IN CONTROL OF THAT. I can only be in control of where I am and how I interact with them. If I chose to meet them where they are, we will be together and I can help them on the journey. If I stand at the finish line, impatiently waiting for them to show up, expecting them to arrive in a place they cannot get to on their own, I am choosing stress for all of us. The dear and brilliant Brian Barabe told me once that TPRS is like yoga…and to use the mantra “You are where you are supposed to be.” I need to remember that more often. Over the years, many teachers have crafted a list of “behavior rules” for their classes as a way to get classes to work together. I knew that I needed to outline something similar for my new students but inside I was cringing at the idea that students with between 7 and 9 years of schooling needed “behavior rules.” I mean, I know that kids don’t always “behave” but it isn’t because they don’t know, by now, what appropriate school behavior is!! Listening Well means paying attention to what is said and what it means. I figured that that could cover a lot of bases! Listening Well is Skill #1 because nothing else in acquisition happens without it…especially for Novices. I can check in with my beginners by simply asking them what I said and what it means. What Listening Well looks like needed to be clarified for them. The idea is, I told them, that if the class can hear me, they will know when and how to add interesting pieces to the story. And for a while in every single class, they were able to demonstrate that skill!! For the 8th graders ‘a while” was between 15 and 20 minutes. For the 6th graders it was between 10 and 15 minutes!! I made it clear that when the skill got too difficult, we would change activities…so once I had to refocus any class for the second story I paused the story-asking and told them how we would continue next. (See the post-script at the bottom!) And then we moved on to another activity. They didn’t want to end it (yay!) but I did. I wanted to pause each story before it fell apart (or I did!). Next post: Skill #2: Responding Well. FYI….I still did a LOT of waiting until they were quiet, staring at whisperers (with a smile of steel), and walking over and standing next to the easily distracted!! I was not as patient with one group as I would have wanted!!!! It’s a fine line between calling a student out on behavior and publicly embarrassing him/her. In Middle School it’s even more delicate…I’m learning and re-learning! 8th grade classes B and C: Identified a character and setting, identified a problem. Final activity: In Spanish, write down where (location) the character goes to solve the problem and why. Hand in before leaving. 6th grade classes: Identified a character and setting. Given a problem: The character needs ____________. Final Activity: Write down in Spanish two things the character might need. Here are some things that you might be able to try…. My guess is that you have several artistic kids who could, themselves, create incredible images for this. Where are people when they are not alone, but feel alone? This is a good question to start with because they don’t have to talk about situations that they have been in personally…it is about places where, although there are lots of people, we might not know anyone, or we might not be understood. Which leads to the next question…. Do people feel alone in a ___________________ because they do not know anyone? Next, offer them a series of reasons why people might feel alone…..
•	They have a problem that no one knows about. •	They are missing someone special. •	They want to be somewhere else. •	They do not like what other people like. •	They do not usually go anywhere alone. •	No one is talking to them. •	They look different than other people. •	Everyone else has someone to talk to. •	They are treated badly. •	They learn something new and very surprising about themselves. A great movie for this that many of them have seen (and if they haven’t it is easy to describe and imagine) is I Am Legend with Will Smith (2007) where he is the last human survivor in NYC. I simply ask them to match the movie with the situation…or situations. Harry has a problem that his human family doesn’t know about, he looks different because of his lightning-shaped scar, he is forced to live under a staircase at his uncle’s home, he is an orphan, he just found out that he is a wizard, he has to go to a new school…it goes on and on! Another good connection would be books that students may be reading or may have read as part of the English curriculum….or historical figures This is a great way to connect curriculum. Our students read Alas, Babylon, To Kill A Mockingbird, Romeo and Juliet, Of Mice and Men and several others that have characters that lend themselves to this discussion. How about Rosa Parks? Martin Luther King? Abraham Lincoln? Anne Frank? Helen Keller? Albert Einstein? That list could go on and on….. Even “famous” people who have “fallen”: Tiger Woods, Mike Tyson, Ben Rothlisberger….folks who may have felt quite alone when they had moments in which the world no longer saw them as idols. These activities or discussions do not have to take a long time. They could simply be the topic for a quick discussion….or a longer activity….whatever works best with your students and your program. Once students are comfortable with the topic, it is easier to switch into a more personal mode with them. Brainstorm with the kids things that people do when they feel alone. Cry, sleep, read, listen to music, get on the computer, call someone, draw, write, run, make plans. Do you listen to sad music or happy music? Which singer/band is good when you feel alone? Why do some people read and other people run? Why do some people like to be alone? Who do some people hate it? George would pay $200 to be alone for an entire day. Let them create a life that would make George want to be alone. They will draw from their own experiences, I guarantee it! Angus has to stay at his grandmother’s house and dog-sit on Halloween night. She lives in the woods, the weather is horrible, and the electricity often goes out. Who does he ask to hang out with him and how does he convince them to go? This one came with this: Una canción que describe como nos sentimos aveces cuando estamos tristes, realmente una linda canción que lo escuchabamos en la escena que Mariana se sentía trizte de la telenovela “Mariana”. ps la knción me identifik cuando sty deprimida..
esta canciòn esta super chida te puedes identificar con ella por que hay veces que nuestra vida se vuelve un tormento. •	These feelings are universal. Every human, be they adult or child, male or female, rich or poor, from any kind of family will experience these emotions. •	We can take an active role in improving our situation. I hope that this post helps a bit! 2. Where do I belong? 3. What should I do? As we go through different stages and different ages the answers will change, but our need to seek the answers will not. From our youngest cognitive moments to our oldest, we will carry these questions in our hearts. What does this mean in our classrooms? First, my guess is that the majority of our actions come from whether we have the answers to these questions at any given moment, our feelings about our answers (or lack thereof), and how we got those answers (or why we don’t have them). Can I help my students with those answers for the time that they are in my classroom? I hope so. If they are comfortable with who they are (or with not having to know while they are in my room…), if they feel that they belong in my room, and I have made it clear what they should do while they are in my room ( or created an environment where they can find out without fear of humiliation or punishment) I can seriously reduce the stress level for my students. Second, I can remember that the behaviors that I might find annoying and inexplicable actually serve a purpose…for that student. I can use that knowledge to understand, to be patient, to open doors of communication. Third, I can keep utilizing those themes in my stories, songs, and other lesson details. These questions are part of our hearts, minds and souls. We all can connect with these issues and the struggles, mistakes and victories that stem from seeking the answers. P.S. These questions came from a study, “Romans 12” by Chip Ingram. Here is a key element in our program: Creating readings/stories/conversations around THINK/FEEL/SAY/DO. In a story characters will THINK, FEEL, SAY AND DO things. The first structure is something that Earl SAYS, “I need to tell you something.” The beauty of it is that it immediately implies a feeling. Earl NEEDS to. AND a future action: TELL. This is a seriously powerful structure.Not all structures are this powerful…especially in the lower levels. For example, I choose the structure “wants to eat”. That is what Earl FEELS. It will help things flow if my next structure is not about feeling. So I could choose…. If I need to park on “wants to” I can stay there for a long long time…but if I want to move on (for any number of reasons) I need to pick another structure. DO Earl goes to SuperWalmart………. ALL of which are now connected to the first structure and make sense. Truthfully, teaching beginning students is such a challenge. Their language pool is pretty shallow…it’s hard to dive in deep!! Using the THINK, FEEL, SAY, DO model really helps. One of the challenges we face as teachers is finding ways to help students use their language to express themselves fluently. The best thing that we can do for them is to show them how to communicate with fluency with the language that THEY have acquired…to model for them what it might look and sound like. Susie Gross has often said….Shelter vocabulary, not grammar. But what does that mean? In the past few years I have really practiced this…and I wish that I had “gotten it” earlier because it is an incredibly powerful change in my teaching. But what is it that I have been practicing? Let me try to explain…. In the book that we are working on in, the phrases “brings him/brings her/brings them” show up repeatedly. What I would like to do is to create opportunities to use these phrases over and over and over and over and over again. The teacher is ready to accept your homework. Bring it to her. The miners brought rocks home from the mine. Why should, or shouldn’t, they bring them? The students from France are arriving tomorrow! Our students will be bringing them to school. I’m bringing them….to the party! 1. I just received an email from The New York Yankees. They want to come to watch their biggest fan (Dan) play soccer this Thursday. They will need a ride from the train station in Syracuse…..who in class can (will, would, should) bring them to school? 2. Our French visitors have a free afternoon on Friday and we are taking them around the area. They can leave school at noon and must be back for the football game at 7pm. You get to decide where we go….where should we bring them? 3. Silly Bandz is sponsoring a local contest. You can win $500 if you can write a letter that convinces our principal to put on 500 Silly Bandz and wear them to school every day for a week. What would you write in your letter? 4. Start a campaign to convince parents that they should no longer bring their children with them to every family function. What is a function that teens do NOT want to attend and why shouldn’t parents bring them? 5. School policy says “no coffee, no soda” in classes. Should students be allowed to bring them to class? Why or why not? 1. Day of the Dead….a great opportunity to talk about the ofrendas, the people who are honored and what families bring to the ofrenda. 1. My cat threw up three times. ____A. Bring them to a recycling container! 2. My Mountain Dew cans are empty. ____B. Bring them to school! 3. My clothes are dirty. ____C. Don’t bring them to your mother! 4. My Mercedes Benz needs a new owner. ____D. Bring it to the vet!! 5. My cousins are the Jonas brothers. ____E. Bring it to me! Listening Songs….Again….I googled lleva+letra (Spanish for lyrics) and found…. Imagine how powerful this kind of repetition could be with idiomatic expressions that just don’t “click” easily? It takes some practice to start “thinking” this way, but I promise you…once you get started it is a little like playing around with puns…you start to see them everywhere!!! All content of this website ©Hearts For Teaching 2009-present and/or original authors. Unauthorized use or distribution of materials without express and written consent of the owners/authors is strictly prohibited. Examples and links may be used as long as clear and direct reference to the site and original authors is clearly established.